Last week I was speaking at a conference on the West Coast when a weather pattern emerged that threatened both my connecting flight, and my arrival at home. Alerted to the potential problem, I began seeking alternatives. Eventually, I was able to reroute my connecting flight—though doing so meant a later arrival at my home airport and, based on the trajectory of the storm, that later arrival increased the likelihood of running into problems there. I continued to check in back home during the day—trying to gauge the storm’s progress, and to (re)evaluate my alternatives. As I boarded that final leg of the trip home, I knew a couple of things: The flight was (still) departing on time, and while it wasn’t snowing at home (yet) the forecast was now for more snow, starting later. The trip home wasn’t exactly restful (despite the hour), but having done what I could to minimize the impact of the storm on my travel, having attended to the things I could control, I boarded the plane, hopeful that the combination of my new route home, the pilot’s skill, and the storm’s track would result in a satisfactory, if somewhat stressful, conclusion. Earlier this year EBRI was approached by Money Magazine to use the EBRI Retirement Security Projection Model® (RSPM)¹ to evaluate a number of potential retirement preparation scenarios, taking into account varying levels of household income, debt, marital status, retirement plan participation, health, etc. Selected results from that analysis, published in the March issue (see “Dream Big, Act Now: Six Secrets of Retirement” online here), showed the impact that various factors could have on the chances of running short of money in retirement. Real as those factors are, many of life’s circumstances are completely beyond our control. However, some of the most important factors—including the decision to participate in a workplace retirement plan, or the amount we choose to save—are not. Consider a 45-year-old female worker who is currently making $50,000/year, with a current retirement savings balance of $50,000. 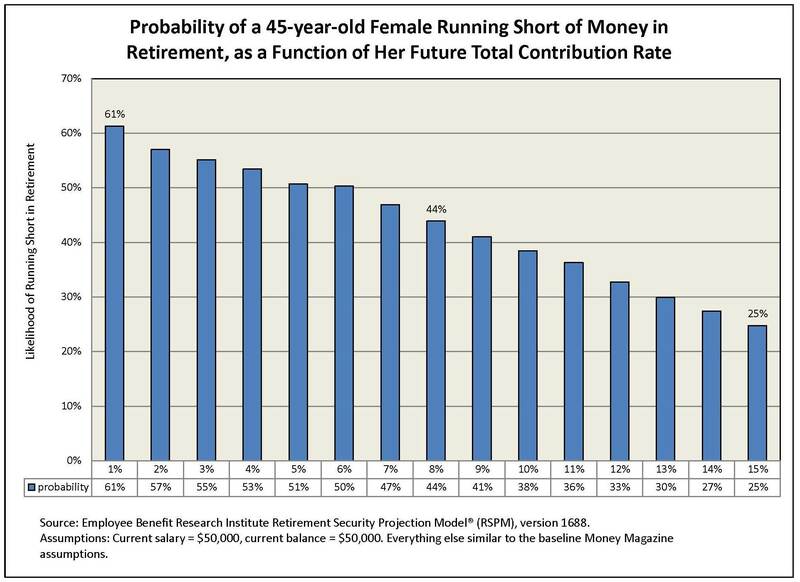 Applying the RSPM model,² we find that if she contributes 1 percent of pay to her retirement savings each year, there is a 61 percent chance that she’ll run short of money in retirement. On the other hand, a 10 percent annual contribution rate (which could be her’s along with an employer match) reduces that probability to 38 percent, while a 15 percent annual contribution rate reduces that risk to just 1 in 4 (see chart below). My flight home from the conference was never risk-free, even before Mother Nature decided to throw a wrench into my carefully designed itinerary. That said, having the potential problem highlighted early enough allowed me to take steps to avoid the worst of what surely would have been a very long and arduous flight home, arriving home two hours later than I had originally planned, but well ahead of my likely arrival had I stayed on my original flights. ¹ RSPM grew out of a multi-year project to analyze the future economic well-being of the retired population at the state level. After conducting studies for Oregon, Kansas, and Massachusetts, a national model—the EBRI Retirement Security Projection Model® (RSPM)—was developed in 2003, and by 2010 it has been updated to incorporate several significant changes, including the impacts of defined benefit plan freezes, automatic enrollment provisions for 401(k) plans, and the recent crises in the financial and housing markets. EBRI has recently updated RSPM for changes in financial and real estate market conditions as well as underlying demographic changes and changes in 401(k) participant behavior since January 1, 2010 (based on a database of 23 million 401(k) participants).More information, and a chronology of the RSPM is available online here. ² This application of the RSPM assumed stochastic returns with an average of 8.9 percent for stocks and 6.3 percent for bonds. It depends on your definition of “enough,” for one thing—and it might well depend on your definition of retirement, certainly as to when retirement begins, not to mention your assumptions about saving and/or working during that period. (1) While those are individual choices (sometimes “choices” imposed on us), they can obviously make a big difference in terms of result. However, the focus of the recent Senate HELP hearing quickly turned from an acknowledgement that many workers aren’t saving enough to what to do about it. In a recent response to questions posed at the hearing,(3) EBRI Research Director Jack VanDerhei compiled a list of alternatives that EBRI research has modeled in recent years, some mentioned at the hearing, along with the impact each is projected to have on that cumulative savings shortfall. The availability of defined benefit (pension) plans. Future eligibility for a defined contribution (401(k)-type) plan. Increasing the 401(k) default deferral rate to 6 percent. Job changes and default deferral rate restarts. 401(k0 Loans and pre-retirement withdrawals. Ultimately, if you’re looking to solve a problem, it helps to know what problem you’re trying to solve. And you don’t just want to know that a solution will make a difference, you want to know how much of a difference that solution will make. (1) Many other projections overlook, implicitly or explicitly, uninsured medical costs in retirement, and many simply publish a projected average result that will be correct only 50 percent of the time, without acknowledging these limitations. Moreover, while various estimates have been put forth for the aggregate retirement income deficit number, when taking into account current Social Security retirement benefits and the assumption that net housing equity is utilized “as needed,” as well as uninsured health care costs, the EBRI Retirement Security Projection Model (RSPM) indicates the aggregate national retirement income deficit to be $4.3 trillion for all Baby Boomers and Gen.
(2) Nearly one-half (49.1 percent) of Gen Xers are projected to have at least 20 percent more than is simulated to be needed, for example, while about 1 in 5 (19.4 percent) are projected to have less than 80 percent of what is needed. See “All or Nothing? An Expanded Perspective on Retirement Readiness,” online here. (3) The EBRI response to the Senate HELP hearing questions is available online here. (4) See “Retirement Income Adequacy for Boomers and Gen Xers: Evidence from the 2012 EBRI Retirement Security Projection Model,” online here. Tax Incentives for Retirement Plans: Lessons from Denmark? 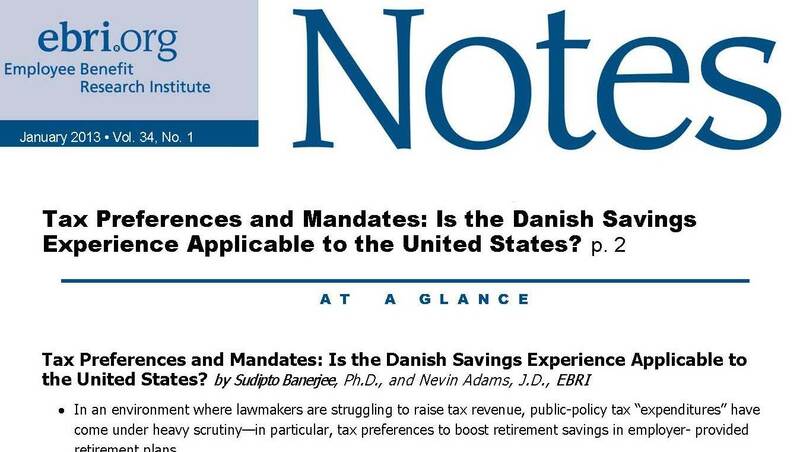 A recent study found that tax incentives for retirement savings in Denmark had virtually no impact on increasing total savings But are those findings relevant to the United States? Maybe not, according to a new report by EBRI: The two retirement systems have some similarities but also major differences—mainly that, unlike in the United States, in Denmark the availability of employment-based, tax-deferred retirement plans is not tied to the tax-deferred status of the accounts. At issue are so-called “tax expenditures” in the United States—preferential tax treatment for public policy goals such as retirement, health insurance, home ownership, and a variety of other issues—that currently are under heavy scrutiny in the debate over the federal debt, taxes, and spending. The authors of the study on Danish savings behaviors offered statistical evidence that changes in tax preferences for Danish work place retirement savings plans had virtually no effect on total savings of those affected by the change. This has drawn the attention of those interested in considering a modification of the long-standing tax preferences for employment-based retirement savings plans in this country. However, aside from the differences in incentive structures between the two countries, the EBRI report notes that study of Danish workers examined only the impact that changes in tax incentives for work place retirement plans might have on worker savings behaviors—but did not address how employers might react to changes in retirement savings tax incentives. “401(k) breaches undermining retirement security for millions,” was the headline of a recent article in the Washington Post. (1) No, we’re not talking about some kind of data hacking scandal, nor some new identity theft breach. Rather, those “breaches” are loans and withdrawals from 401(k)s.
While the article primarily deals with the potentially negative aspects of loans and withdrawals, it also touches on some broader concerns—and does so with some factual inaccuracies. For example, the article incorrectly states that “in 1980, four out of five private-sector workers were covered by traditional pensions;” in fact, only about half that many actually were at that point (a correct statement would be that 4 out of 5 covered by a plan at that time were in a traditional pension, which works out to about 2 in 5 of all private-sector workers—which puts the article’s “now, just one in five workers has a pension” statement in a far more accurate context). The article notes that the “most common way Americans tap their retirement funds is through loans,” although U.S. Department of Labor data indicate that loan amounts tend to be a negligible portion of plan assets and that very little is converted into deemed distributions in any given year. That finding is supported by hard data from the EBRI/ICI 401(k) database, the largest micro-database of its kind: Among participants with outstanding 401(k) loans in the EBRI/ICI database at the end of 2011, the average unpaid balance was $7,027, while the median loan balance outstanding was $3,785. (3) The Washington Post article cautions that these loans “must be repaid with interest,” but fails to mention that the 401(k) participant is paying interest to his/her own account: Those repayments represent a restoration of the retirement account balance by the participant, as well as a return on that investment. Sure, that interest payment is coming from the participant’s own pocket, but it’s generally being deposited into their own retirement account, and (if it was being used to pay down debt) likely at a much more favorable rate of interest. The HelloWallet report describes defined contribution (DC) retirement plans as a “marginal contributor to the actual retirement needs of U.S. workers.” However, an EBRI analysis of the Federal Reserve’s Survey of Consumer Finance (SCF) data, looking at workers who are already retired, finds that DC balances plus IRAs—which for many retired individuals were funded by rollovers from their DC/401(k) plans when they left work—represent nearly 15 percent of their total assets (which includes things like houses, but does not include Social Security and defined benefit annuity payments, although DB rollovers are included), and nearly a third of their total financial assets, as defined in the SCF. The dictionary describes a “breach” as an “infraction or violation of a law, obligation, tie, or standard.” The article quotes the HelloWallet author as noting that “What you have is 401(k) participants voting with their wallets saying they would much rather use this money for other purposes.” However, these reports can’t always know, and thus don’t consider, how many participants and their families have been spared true financial hardship in the “here-and-now” by virtue of access to funds they set aside in these programs(5) (an AonHewitt study,(6) cited both in the article and in the HelloWallet report, notes that just over half of the hardship withdrawal requests were to avoid home eviction or foreclosure). It’s hard to know how many of these “breachers” would have committed to saving at the amounts they chose, or to saving at all, if they (particularly the young with decades to go until retirement) had to balance that choice against a realization that the funds they set aside now would be unavailable until retirement. We don’t know that individuals who chose to save in their 401(k) plan did so specifically for retirement, rather than for interim (but important) savings goals—such as home ownership or college tuition—that, sooner or later, make their own contributions to retirement security. Indeed, what appears to a be a short-term decision that might adversely affect retirement preparation may actually be a long-term decision to enhance retirement security with a mortgage paid off or higher earnings potential. In sum, we don’t know that these decisions represent a “breach” of retirement security—or a down payment. (1) The Washington Post article is online here. (2) You can request a copy of the HelloWallet report here. (3) For an updated report on participant loan activity from the EBRI/ICI database, see “401(k) Plan Asset Allocation, Account Balances, and Loan Activity in 2011,” online here. (4) While the Post article states that these taxes would be paid at capital gains rates, in fact, withdrawals are taxed as ordinary income. (5) See “’Premature’ Conclusions,” online here. (6) See “Leakage of Participants’ DC Assets: How Loans, Withdrawals, and Cashouts Are Eroding Retirement Income 2011,” online here. Why do some retiring workers with a pension choose to take a stream of lifetime income, while others cash out their entire benefit in a lump-sum distribution? Amidst growing concerns about workers outliving their retirement savings, this has emerged as a key issue—and it depends to a large extent on whether the individual pension plan allows or restricts lump-sum distributions (LSDs), according to new research by EBRI. A better understanding of these decisions stands to shed light not only on the outcomes for traditional pensions, but also for defined contribution plans, where LSDs are the rule rather than the exception. EBRI’s research, the first time this level of analysis has been done on this scale, reveals that differences in defined benefit (DB) plan rules or features result in very different annuitization rates. In fact, the results show that the rate of annuitization—the rate at which workers choose to take their benefit as an annuity—varies directly with the degree to which plan rules restrict the ability to choose a partial or lump-sum distribution. In choosing an LSD, the individual takes on the investment risk and responsibility for managing the distribution, and, ultimately, arranging his or her own income flow in retirement from those funds. Analyzing data from more than 80 different pension plans, EBRI compares the “annuitization rate” among individuals at various age, tenure, and account balances, along with the rules and distribution choices within individual pension plans. EBRI found that between 2005 and 2010, pension plans with no LSD distribution options had annuitization rates very close to 100 percent. In contrast, the annuitization rate for defined benefit and cash balance plans with no restrictions on LSDs was only 27.3 percent. The report notes that through the 1960s DB pension plans offered mainly one distribution choice: a fixed-payment annuity. That changed beginning in the 1970s, as some DB plans began to offer the option of full or partial single-sum distributions, and as “hybrid” pension plans expanded in the 1980s, so did distribution options. Today, most DB pension plans offer some type of single/lump-sum option, in addition to the traditional annuity choice. Years ago―when my kids were still kids―we discovered an ingenious Web site1 that purported to offer a real-time assessment of your “naughty or nice” status. As parents, we rarely invoked the name of Santa to encourage good behavior, and for the very most part our children didn’t require much “redirection.” But no tone of voice or physical threat ever had the impact of that Web site―if not on their behaviors (they were kids, after all), then certainly on the level of their concern about the consequences. In fact, in one of his final years as a “believer,” my son (who, it must be acknowledged, had been PARTICULARLY naughty that December) was on the verge of tears, worried that he’d find nothing under the Christmas tree but the coal and the bundle of switches he surely deserved. One could argue that many participants still act as though some kind of benevolent elf will drop down their chimney with a bag full of cold cash from the North Pole, that somehow, their bad savings behaviors throughout the year(s) notwithstanding, they’ll be able to pull the wool over the eyes of a myopic, portly gentleman in a red snow suit. Next month we’ll field the 23rd annual version of the Retirement Confidence Survey,2 where we will, among other things, seek to gain a sense of American workers’ preparation for (and confidence about) retirement, as well as some idea as to how those already retired view the adequacy of their own preparations. In previous years we’ve seen confidence wax stronger and then wane―and we’ve seen distressingly low levels of preparation that sometimes seem at odds with the high confidence expressed. However, in wake of the Great Recession, we’ve also seen a growing awareness of the need for those preparations,3 and cognizance of the challenge in doing so. We’ve also seen regrets that more wasn’t done earlier, at a time when the options were greater, and time an asset. Ultimately, the volume of presents under our Christmas tree never really had anything to do with our kids’ behavior. As parents, we nurtured their belief in Santa Claus as long as we thought we could (without subjecting them to the ridicule of their classmates), not because we expected it to modify their behavior (though we hoped, from time to time), but because kids should have a chance to believe, if only for a little while, in those kinds of possibilities. We all live in a world of possibilities, of course. But as adults we realize—or should realize—that those possibilities are frequently bounded in by the reality of our behaviors. Yes, Virginia, there is a Santa Claus—but he looks a lot like you, assisted by “helpers” like the employer match, tax incentives, automatic enrollment and deferral increases, and qualified default investment alternatives. (1) The Naughty or Nice site is STILL online, here. (2) More information about the Retirement Confidence Survey, as well as results from prior years, is available online here. (3) That first step on that path, and it’s a critical one, is to Choose to Save.® A great place to start those preparations figuring out quickly what you’ll need is the BallparkE$timate,® available online here. Organizations interested in building/reinforcing a workplace savings campaign can find free resources—and a handy schedule of events around which to construct a program—courtesy of the American Savings Education Council (ASEC). Choose to Save® is sponsored by the nonprofit, nonpartisan Employee Benefit Research Institute Education and Research Fund (EBRI-ERF) and one of its programs, the American Savings Education Council (ASEC). The Website and materials development have been underwritten through generous grants and additional support from EBRI Members and ASEC Partner institutions.